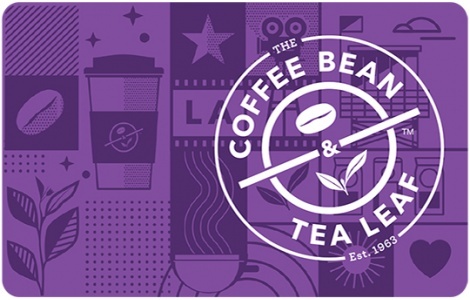 The Coffee Bean & Tea Leaf® brand is one of the world’s leading roasters and retailers of specialty coffee and tea. The Coffee Bean & Tea Leaf brand works directly with local growers to source the finest ingredients and flavors from around the world. The coffee pioneer only selects from the top one percent of Arabica beans from the world’s best growing regions, including Costa Rica, Colombia, Kenya, Indonesia and Jamaica. The Coffee Bean & Tea gift card is a great way to treat yourself or makes a good gift for family, friends, and coworkers. Use of this card constitutes acceptance of the following terms: The Coffee Bean® card and e-card is redeemable for merchandise, food, and beverages at participating The Coffee Bean & Tea Leaf® stores in the U.S. and coffeebean.com. Not redeemable for cash unless required by law. Any item purchased with a gift card is subject to the applicable store or online return policies. The remaining balance on lost, stolen, or damaged cards will be replaced only with original sales or gift receipt. This gift card cannot be used to purchase other gift cards. No expiration date, no fees. For balance inquires, use The Coffee Bean® Rewards App, call 1(855) 409-7410 or go to coffeebean.com. Gift card number and PIN number are required for all inquiries. ©2019 International Coffee & Tea, LLC. All rights reserved.